1/2 pound whole-wheat pasta (you can use any small-shaped pasta here, including penne or even macaroni or orzo. 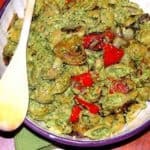 I used orecchiette which is one of my favorite pastas). Cook according to package directions and drain. 1 fennel bulb , cut out the leaves and set aside for the pesto. Roast the vegetables in a 400-degree oven , stirring a couple of times during cooking, until they are fork-tender and coated with a balsamic glaze. This took me about 35 minutes. Place all the ingredients in a food processor (except the olive oil) and process until coarsely powdered. With the motor running, pour in the olive oil until you have an even paste. /4 cup chopped, toasted walnuts.